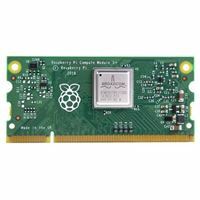 The Raspberry Pi Compute Module 3 + (CM3+) are DDR2-SODIMM-mechanically-compatible System on Modules (SoMs) containing a processor, memory, eMMC Flash (except "Lite" version) and supporting power circuitry. These modules allow a designer to leverage the Raspberry Pi hardware and software stack in their own custom systems and form factors. In addition the modules have extra I/O interfaces over and above what is available on the Raspberry Pi model A/B boards, providing more options and fostering rapid development for the designer. The Compute Module 3 + 8GB has a 200 pin SODIMM design and contains 8GB of on-board eMMC flash memory.